Slade castle. 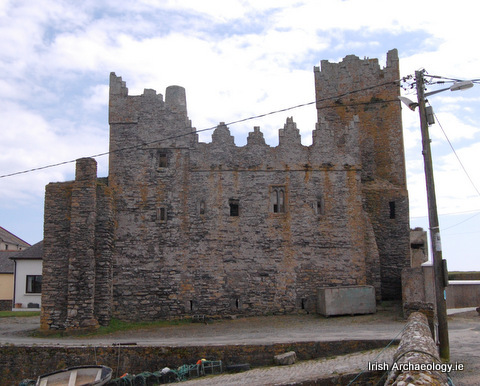 Located in the picturesque fishing village of Slade on the Hook Peninsula in Co. Wexford this remarkably well-preserved castle was built by the Laffan family. 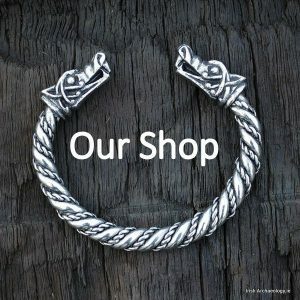 Of Anglo-Norman stock, the Laffans were among the first wave of colonists to arrive in Ireland after Richard de Clare’s (Strongbow) invasion of 1169/70. 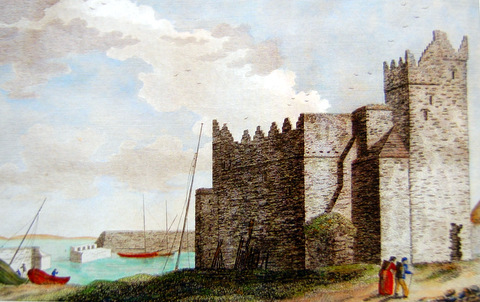 They quickly became established in Wexford and were ensconced at Slade since at least the 15th century. Holding the townland as tenants of the manor of Kilcloggan, their actual estate was relatively small, containing only 86 hectares of land (Colfer 2004, 157). This suggests that other sources of revenue, such as fishing and maritime trading, must have funded the construction of this elaborate dwelling. 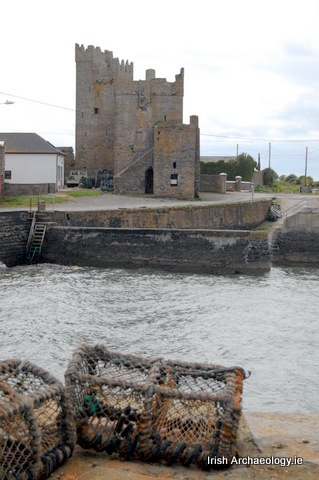 The earliest part of the castle is the slender tower, which was probably constructed sometime in the 15th century. Four storeys in height, the ground and third floors have vaulted ceilings, while the battlements are defended by stepped crennelations. The entrance doorway, which is located in the southern wall of the tower, is protected by a machicolation and a murder-hole. The main living room of the tower was located on the second floor where a fireplace and garderobe (toilet) still survive. 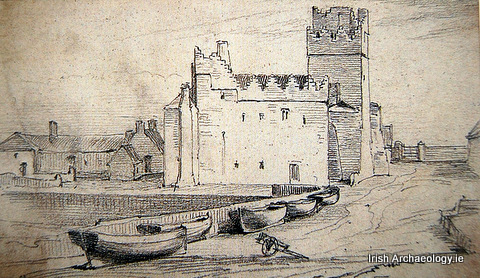 In the 16th century a large, two storey defended hall was added by the Laffans. The entrance lobby of the hall is protected by a murder-hole, which allowed the defenders to pour boiling water or oil down on attackers. This defended lobby gives access to a vaulted ground floor divided into three separate chambers. There is a large fireplace at the western end and oubliette in the southern wall of the eastern chamber. The second floor is accessed via a mural staircase and is also divided into three rooms. Light and warmth was provided by a large fireplace locate in eastern wall of the central chamber. The top of the hall contains identical stepped crenellations to those seen in the adjoining 15th century tower. In the 19th century Slade castle was converted into a ‘tenement’ by dividing it into several ‘apartments’ (see image below). This involved building new doors and windows and the construction of external steps to the first floor of the fortified house. In 1872 the Loftus estate maps record three families living in the castle at a rent of 5 shillings per year (Colfer 2004, 153). 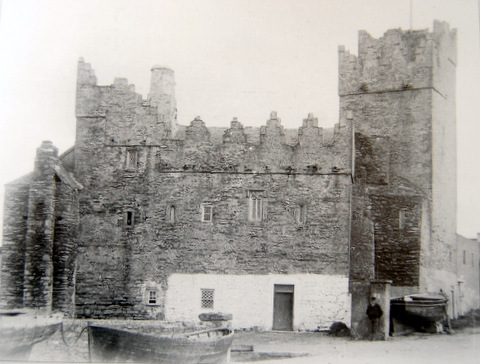 When the castle was taken over by the Office of Public Works in the 1940s most of the 19th century alterations were removed. Colfer, B. 2004. The Hook Peninsula. Cork University Press, Cork. The LAFFAN family still lives in Taunton ,Mass. 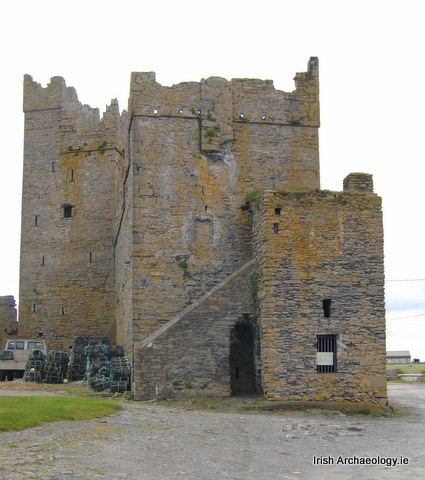 today and should go visit this castle for free from the Office of Public Works of Wexford and look up family members there. I am curious whether there are still Laffans in the Wexford area. 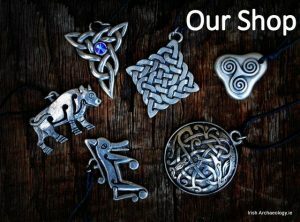 We are planning a trip to Ireland first part of July. My sister and I are both Laffans and would be 8nterested in possibly lo9king up family. Any help would be appreciated. Would like to know how the name Slade came about? My grandmother was a Slade.